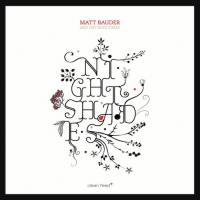 At the release concert for this record, held at the Cornelia Street Cafe on February 19 of this year, I was reminded how I wish I got more opportunities to hear Matt Bauder perform his music live in New York City. The atmosphere was electric and the music exquisite. This sophomore release by Bauder’s quintet a Day in Pictures is a daring musical venture set to challenge our expectations by tying together a diffuse array of ideas, emotions, and styles. It is impressive how all of the sonic elements displayed here, unfolded one after another, fit so comfortably together. Exemplary of his generation of players, Bauder has made a mockery of the simplistic categories that are often applied to this type of music: in, out, mainstream, avant garde, experimental, traditional–these have no bearing here. The six tracks on this record move in all sorts of directions while maintaining an internal, vital heartbeat that gives it cohesion. From the beginning of the record, there is a late night feel. Not the dwindling fire of exhaustion, but rather the type of gathering that finds its second wind in the early hours before finally surrendering to the deep silence before the dawn. “Octavia Minor” opens gently, but we are soon introduced to the shroud of rhythmic intensity that pervades much of the rest of this record. Bauder’s writing casts down a shimmering curtain of deep, dark, pulsing energy that lies in wait, at times, like a lion about to pounce upon unsuspecting prey. “Weekly Resolution” announces the presence of pianist Kris Davis–new to the group–as she leads the way through the opening moments. Tenor and trumpet also focus the sound of the piece, making it quite dynamic. Then, there is growing dissolution which reaches its climax with Wooley’s solo, only to be reconstructed by piano, drums, and bass. “Starr Wykoff” opens with an extended solo by Bauder that exhibits a great variety of ideas, patiently explored one by one. “Rule of Thirds” is one of the things that makes this record great–on the surface it is the most abstract piece. But Bauder achieves a rare alchemy here by blending a relaxed feel with a turbulent yet decisive rhythmic underbelly. Wooley lifts the piece to its most ecstatic moments with his solo. The lion has been unleashed. “August and Counting” explores group improvisation with an occasional thick brushstroke of deep color. “Nightshades” gives the record a measure of resolution, bringing us back to some of the opening themes, and eventually fading into the refreshing embrace of silence. This is an excellent record. The sound is crisp and refined throughout while retaining the energy of spontaneity. Bauder and Wooley are well-matched for the different styles they bring to the group. Fujiwara and Ajemian have a deep understanding and Davis adds fresh jolts of vitality throughout. Nightshades lives and breathes like an organism–emerging, developing evolving, and rising to great heights before receding, transforming listeners in its wake.